Frank Reich completed 12 of 15 passes for 260 yards and led the 'Terps to six straight touchdowns in the second half. Years before he led the greatest comeback in NFL history, Frank Reich was at the helm in the greatest comeback in college football history when he led the Maryland Terrapins back from a 31-point deficit and to a 42-40 win over the Miami Hurricanes on November 10, 1984. Reich arrived at the University of Maryland in 1980 but did not get much playing time as he was redshirted during his freshman season and then was the back-up to Boomer Esiason from 1981 through 1983. Reich finally got his chance as the starter in 1984 but in the fourth game of the season, Reich separated his shoulder and was replaced by Stan Gelbaugh, who was still the starter when the 5-3 Terrapins arrived at the Orange Bowl to face off against the defending national champions. Miami entered the game with as the #6 ranked team in the country with an 8-2 record under first-year head coach Jimmy Johnson, who had come from Oklahoma State to replace the departed Howard Schellenberger. 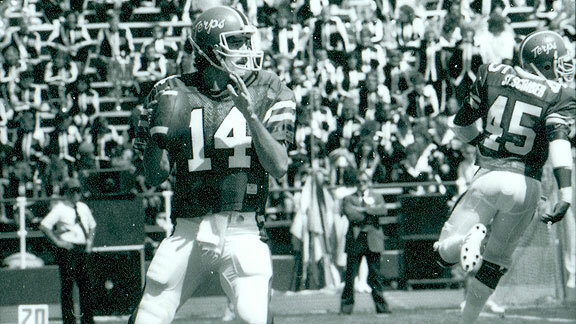 The ‘Canes were led by redshirt sophomore quarterback Bernie Kosar, who was a candidate for the Heisman Trophy and all-American wide receiver Eddie Brown. Jimmy Clausen has thrown 12 touchdown passes in 2009 with just two interceptions. It was another interesting weekend of college football as several ranked teams received unexpected challenges while a couple teams solidified their place in the rankings. 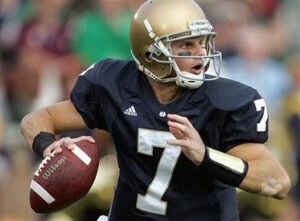 I’m not ready to call the 2009 Notre Dame Fighting Irish a good team, but they are definitely entertaining. Now 4-1 following a 37-30 overtime victory over the University of Washington, the last four games for the Irish have been decided by a total of 17 points with all of them going down to the wire. Except for in the 38-34 loss to Michigan when the Wolverines scored in the final seconds to pull out the win, Notre Dame has been able to make big plays when it counts. That is a far cry from a year ago when Notre Dame finished 7-6 and seemed to always fall just short in crunch time. I’m sure that the legions of Notre Dame faithful across the country are ready to claim the return of the “Golden Dome Aura”, and I suspect the Irish will probably inch back into the top 25 this week. 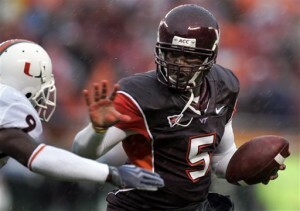 Virginia Tech ended Miami's brief foray into the top 10 with a dominating 31-7 victory. One of the early themes of the 2009 college football season has been the revivals demonstrated by a number of programs that had struggled in recent years, but gave indications early in this season that they were ready for a return to prominence. Some, like Florida State, Miami and Michigan were looking to return to their one-time place among the national elite while others, including California, Mississippi and North Carolina, seemed poised to enter the national championship conversation for the first time in generations. Well, I guess revivals aren’t what they used to be. Many of those teams were soundly defeated, some by lesser competition, and all struggled on the last weekend of September. The poster child early this season for the theme of returning to prominence has been the University of Miami. Following impressive victories over Florida State and Georgia Tech, many well-respected national college football “experts” were gushing over how the “U” was back in the national picture. In fact, they went from being unranked at the start of the season to ranked 9th nationally after just two games. Michigan Freshman Tate Forcier led the Wolverines to a late victory over Notre Dame. Each Sunday during college football season we look at some of the big games, stories, and events from the action of the week. I noticed a lot of similarities between the outstanding game Saturday afternoon between Michigan and Notre Dame and the equally entertaining contest last Monday night between Florida State and the University of Miami. Both games featured two teams with proud football traditions that have been struggling in recent years, but appear to be turning the corner back toward respectability. After Miami turned back Florida State’s final charge in the closing seconds of the game, all post game talk was about whether this signaled the return of Miami as a football power and if FSU was also now poised to return to national relevance.